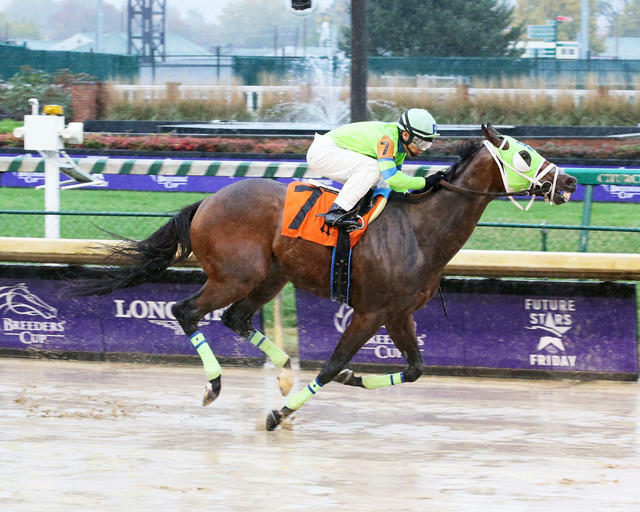 Loooch Racing’s Uno Mas Modelo splashed to a 4 ½-length victory in Thursday’s $101,800 Bet On Sunshine Overnight Stakes, the first stakes victory for trainer Anthony Quartarolo at Churchill Downs. Uno Mas Modelo, a 5-year-old bay gelding by Macho Uno, returned $15, $6.40 and $6. Heartwood, ridden by Tyler Gaffalione, closed for second at odds of 9-1 and returned $7.40 and $7.20 while Silver Ride faded to third and returned $8.20. Control Stake, Switzerland, Fort Fortitude and Rock and Fellers (ARG) rounded out the field. Switzerland, the heavy 1-2 favorite in the Bet On Sunshine, broke slowly under jockey Ricardo Santana Jr. and was not in contention. Uno Mas Modelo earned $62,328 for his seventh victory in 29 starts. Racing returns Friday for “Future Stars Friday”, the first of two days for the Breeder’s Cup World Championships at Churchill Downs. First post is 12:55 p.m. EDT.